Because composite resins are not made of metal, we can blend and mix shades to find the perfect color to match your natural teeth. Also, composite does not cause expansion and contraction of the tooth which can lead to root canal—this was common with old amalgam (silver) fillings. The shade matching with composite fillings means only you and your dentist will know you have fillings. Another pro is that the tooth/composite bond actually supports the remaining tooth structure, deterring breakage and insulating against temperature changes. 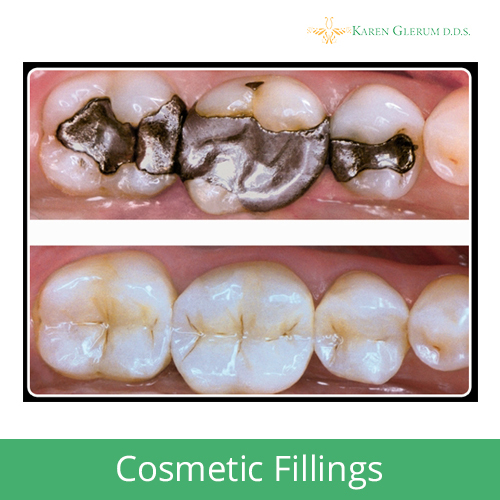 Medium and small composites can last ten to fifteen years – that’s as long as amalgams. Best of all, composite resins allow us to keep more of your natural tooth structure intact than amalgams. Some patients may experience mild and temporary post-placement sensitivity from composite resin fillings. Dr. Glerum places special densensitizing medication under the fillings to avoid this. The only caution we usually mention is that coffee, tea, and other staining foods and beverages may discolor your composites over time. Dr. Glerum places a clear plastic sealant over the filling to maintain its beautiful white shade longer.